As rally competitors slip, slide, and fly down the stages, there’s an etherial presence watching over them, making sure everyone completes the stage safely, and sending help if they don’t. These creatures aren’t angels, spirits, or the Great Green Arkleseizure, but amateur radio operators keeping an eye on the competitors, as well as coordinating logistics to keep the event running safely and smoothly. Your knowledge of amateur radio, also called ham radio (no one seems to know for sure exactly why), if you have any such knowledge at all, probably consists of some old guy pounding out dits and dahs on a Morse code key or monologuing into an ancient microphone about the weather, his tri-band Yagi, or his various medical issues, with some other old guy in Florida. There’s an old joke that the average age of a ham radio operator is dead. I, for one, skew the age demographic not only by actually being alive, but for having had my license since I was 15. Knowledge of Morse code is no longer required, though some, like me, are still fluent and use it anyway. You can still talk into a microphone, or type through your computer using an endless variety of digital communication modes, or even send pictures and video. 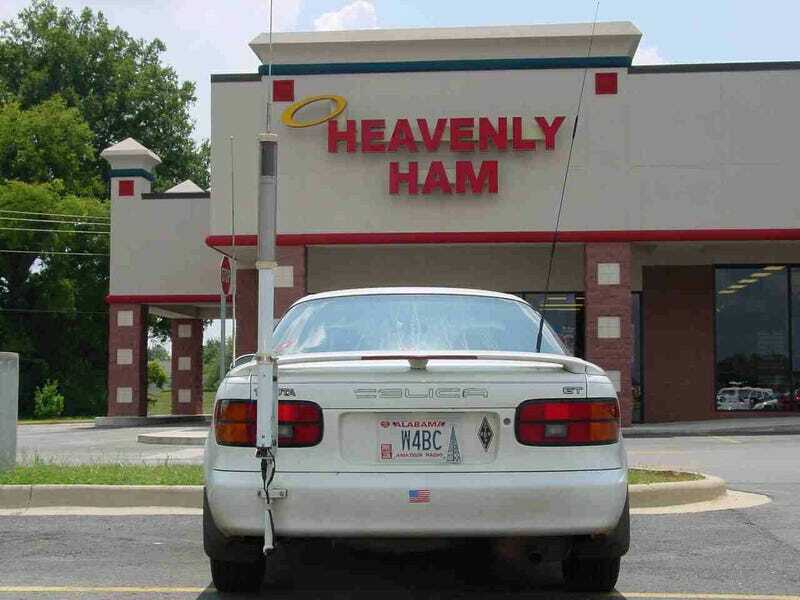 Many assume that ham radio is the same as the Bandit’s CB radio, but that couldn’t be farther from the truth. You need to pass a fairly simple test and get an FCC license to transmit on ham radio frequencies. You can use more power and get much better range than CB. There are also many more frequencies available. Rather than 40 CB channels, hams have access to a wide portion of radio spectrum, ranging from down below your AM dial all the way through to microwaves and beyond. Some of these frequencies are in the shortwave band with worldwide coverage. We can even communicate beyond this world, through satellites and with astronauts in orbit. Years ago, I personally contacted Russian cosmonaut Sergei Krikalev on the Mir space station, and got a nifty card in the mail from him. Although it doesn’t have a Daft Punk soundtrack, the net is where everything happens. It’s a designated frequency where rally communications take place. Most communication is between the start and the finish, each of whom reports which cars have started and completed the stage. If a car starts but doesn’t finish, the sweep team will know about it, and keep their eyes open for it. Competitors running after the missing car can also be asked at the finish if they saw it and what their status is. Furthermore, other radio operators are placed all along each stage. They write down each car number as the start announces it, and check it off as they go by. This way, if a car passes position C but not position D, sweep knows to look for them in this specific area. Course opening cars, sweep, stage captains, and other rally officials also monitor the net, and participate when required. When car 0 completes their run through a stage, it is their radio call that declares the stage ready for competition. If there is a change in plans, such as a stage being cancelled, that call comes over the radio as well. A license is required to transmit on amateur radio frequencies, but it’s perfectly legal to listen with no license at all. Most scanners receive the amateur 2 meter (144-148 MHz) band, where pretty much all rally communications take place. Competitors are often given these frequencies as well, specifically so that they can listen in - or, if they have a ham radio in the rally car and the driver or co-driver are licensed, they can even break into the net themselves to report an emergency. I’ve heard it happen. And that’s the main difference between rally and the other events where hams typically provide communications. Usually, the organization running the event looks for outside help to run the net for them. But in rally, I’ve seen many enthusiasts get their own licenses just to be able to help with communications. There is a wide variety of other activities you can pursue with ham radio, but some never even pick up a microphone outside a rally, and that’s OK. Drivers, co-drivers, and service crews have also picked up ham radio - not just to monitor the net, but for their own team communications. If you bent a control arm on the last stage and need to replace it during service, you can save a lot of time by radioing ahead to your crew so they can be ready to do the job as soon as you pull in. You’re only allowed to spend so much time in service, but there’s no rule against calling ahead! The FCC Technician License exam covers basic regulations, operating practices and electronics theory, with a focus on VHF and UHF applications. Morse code is not required for this license. Then all you need is a basic radio setup. Rally communications take place almost exclusively in the 2 meter band, so any radio that covers 144-148 MHz should work. You can splurge on a fancy multiband radio with handy features like crossband repeat, but a basic radio that only covers 2 meters will work fine, and cost less, especially if you buy a used one. Small handheld radios are particularly affordable, especially the cheap Chinese brands, but you really need the extra power of a mobile radio for rally. They’re still great for listening to the net, though. You’ll also need an antenna. A magnetic mount antenna for the 2 meter band will work just fine. If you intend to install your radio in your car more permanently, or if you don’t want to risk scratching your paint with the magnetic base, a variety of antenna mounts are available, making it easy to find something that will work with your particular vehicle. If you’re ambitious, you could also buy or build an antenna and small mast to set up outside the car once you’re in position, further extending your range. Power to the radio should be supplied directly from your car battery. If you want to use it at home, you’ll need to pick up a cheap 12v power supply, and some kind of home antenna as well. Whether you’re a driver, co-driver, service crew, marshal, or a spectator, amateur radio can add a new dimension to your rally experience. In fact, if you’re currently a spectator, a ham radio license can be your gateway to the best seats in the house, somewhere blocking a crossroad on a stage, away from the normal spectator areas. Rallies are always looking for more volunteers, and a ham license makes you that much more valuable.